I teach with fellow 2hD Director Chris Heuvel at Nottingham Trent University (NTU) and I'm a director of Sneinton Alchemy — a Community Interest Company based in Sneinton, 2hD's local neighbourhood in Nottingham. Sometimes this mix of roles is a bit demanding, but more often than not there's a symbiosis, bringing strength and depth all round. And so it was with a recently-completed project to design a small community allotment building for the "Growin Spaces" project in Sneinton. Alchemy has been training a team of Community Organisers over the last few years: dedicated individuals who go out into the community to listen carefully to people on the streets, in pubs, in mosques, churches and homes. They listen to the young and old, to workers, business owners, those in power and the disenfranchised. They build community networks and gradually empower people to take action, follow their dreams and build a stronger community. And it works. One "proof of the pudding" is the Growin' Spaces project - set up by Stevie Doig. He had an idea about a community allotment which, over time working as a volunteer Community Organiser, he built into a reality. Listening with our team at Alchemy helped him build the mandate he needed to get the wider community on board. This ensured the sustainability of the project and gave him confidence to make broader links and gain important contracts and supply lines. Now Growin' Spaces has transformed many abandoned allotments into productive growing space, providing work experience and structure for long term unemployed along the way. The project also feeds hundreds of local people each month, using allotment produce and "Fare Share" food wasted by supermarkets. The success of the project has generated the need for small buildings on site at the allotments. Initially a place to shelter and lock up equipment, this might expand over time to provide a learning space and other facilities. So Stevie asked me, with my 2hD hat on, if I might be able to help him explore design ideas. 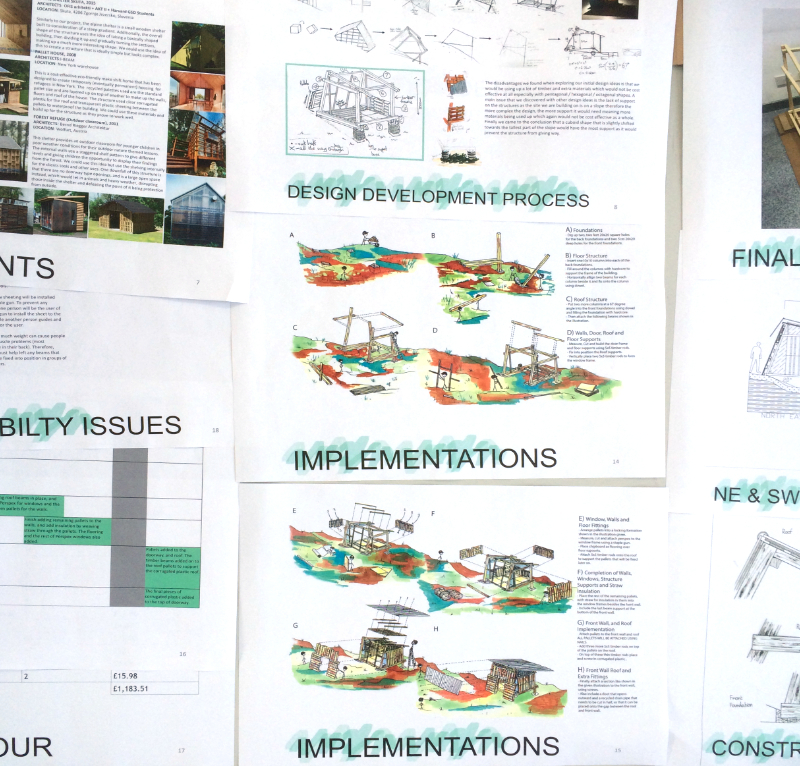 I teamed up with Chris and we identified an opportunity at NTU to create an architecture studio student design project. Chris got the students out on to the allotments, meeting Stevie and his volunteers, and pitching-in with some clearance work. This experience inspired them to create imaginative but buildable designs for a small wooden building using low-tech timber framing. Stevie and the Community Organiser team then came to NTU to interview the students and select their favourite designs. 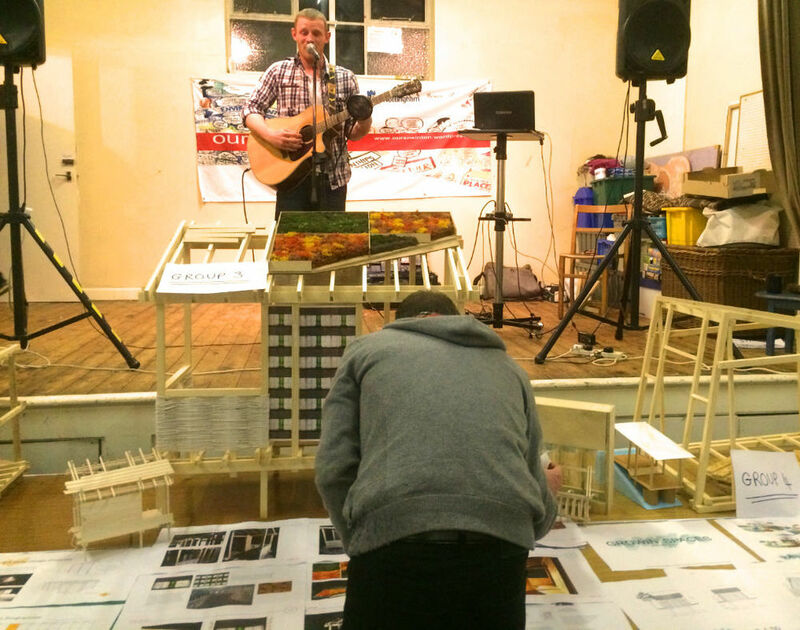 These projects were displayed at the "Our Sneinton" public event, with a winner being chosen by popular vote. Over the summer, the building will be built! Great outcomes, including for NTU meeting a number of the objectives of its new Strategic Plan, including "enriching society", "valuing ideas", "creating opportunity" and "empowering people". So for 2hD, NTU, Sneinton Alchemy and Growin' Spaces, it´s a win, win, win, win situation. Community inspired architecture at its finest! 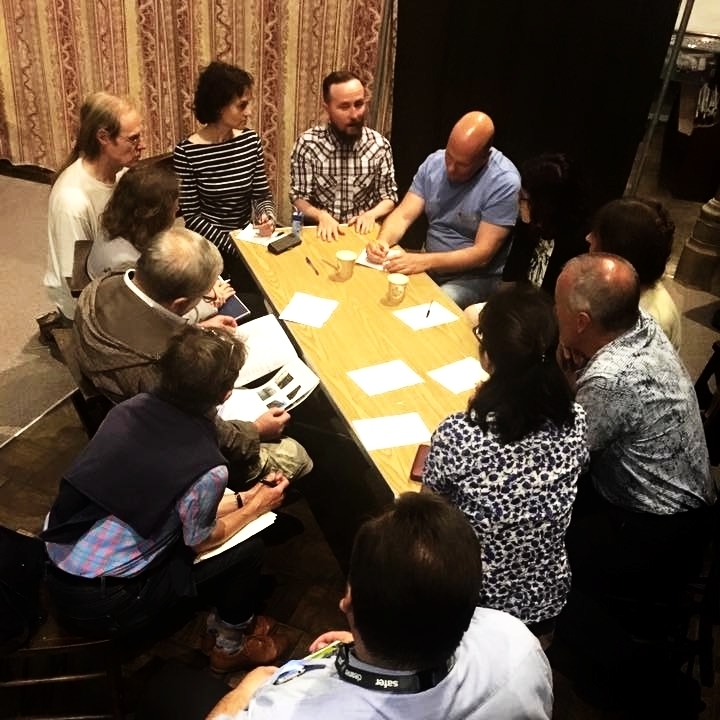 Alina was at the fantastic Font theatre festival recently, and got chatting to Laura Macrae, a producer with Notts based companies Nonsuch and Sheep Soup. One of those chance encounters that were always meant to happen: Laura with a building and a performance space idea, just looking for an architect... and Alina an architect looking to expand her involvement in the theatre. We've worked with several arts organisations on the adaptation of existing buildings to meet their needs, most notably at One Thoresby Street. 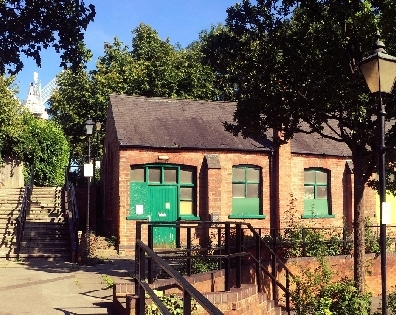 And it is an exciting time for our home neighbourhood on the Eastside of Nottingham: a cluster of independents including OTS, Backlit, Surface Gallery and the Bohunk Institute have led the way and the council is now adding a critical mass via the Creative Quarter and the weighty Dakeyne Street and Sneinton Market redevelopments. Dance4's ambitious dance centre project may be on ice, but the organisation was ahead of the curve in seeing the potential of the area. 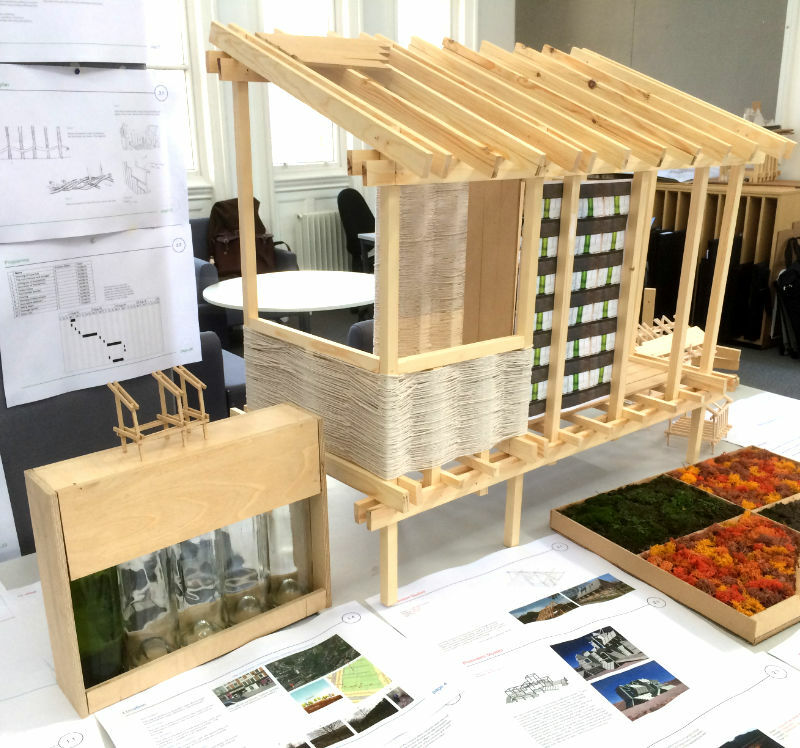 We look forward to supporting Laura's plan in the formative stages and — with the support of NTU's Future Factory — hope to work with recent graduates from the Interior Architecture and Design and Theatre Design courses to develop initial ideas for the building. My involvement with community group Sneinton Alchemy and our community engagement expertise will help Laura to make this the supportive and embedded project she aims for. Under English planning laws introduced in 2011, local communities are able to put together a Neighbourhood Plan. This is a planning document with 'teeth' in the system, which can set out policies formulated by the local community for their particular area. 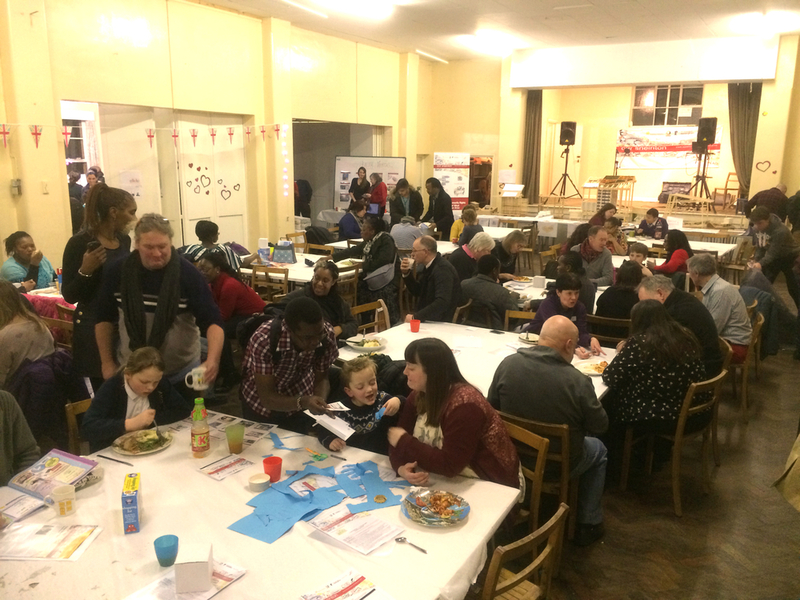 The local area around the 2hD HQ, the Sneinton neighbourhood of Nottingham, is getting together to produce their own Neighbourhood Plan, and 2hD are signed up as members of the Sneinton Neighbourhood Forum which will produce it. I'm giving support as a Steering Group member and helping with the consultation process, mapping, graphics and communications. To explain the big idea of Neighbourhood Planning, I put together the short video below. The Plan has evolved from the Sneinton Vision project, which 2hD also supported. We're delighted to see that the visioning work is going to be continued and gain real traction in the planning system. We've built up considerable expertise in meaningful consultation during the process and it's great to see our local community becoming more empowered and engaged as a result. I've been heavily involved over the last few months in the creation of a Neighbourhood Design Vision for Sneinton, the area of Nottingham where 2hD are based. I'm delighted to say that the Vision has now been launched to the public, with its own website and a downloadable PDF document. The UK planning system is in the process of a major overhaul aimed at giving local communities a greater input, part of the Government's "Localism" agenda. I was interested in how Sneinton might be able to put together a grass-roots vision of its own future, to ensure that Localism works as intended for the area. The essential problem was how to set out a strong set of ideas to resist poor development, but to encourage good developers by letting them know what local people would support. If resisting the bad is hard, encouraging the good is even more difficult. As a director of Sneinton Alchemy, a non-profit company run by local people for the benefit of Sneinton, I wrote to Design Council CABE with a copy of the Chief Planner's letter. I asked the question: "What can you do for us?" The upshot of this was a sucessful joint bid for Design Council CABE funding with OPUN (the architecture centre for the East Midlands), and a 6-month long project to develop the Sneinton Design Vision. You can read the story of how the Vision was created on the Sneinton Alchemy website. 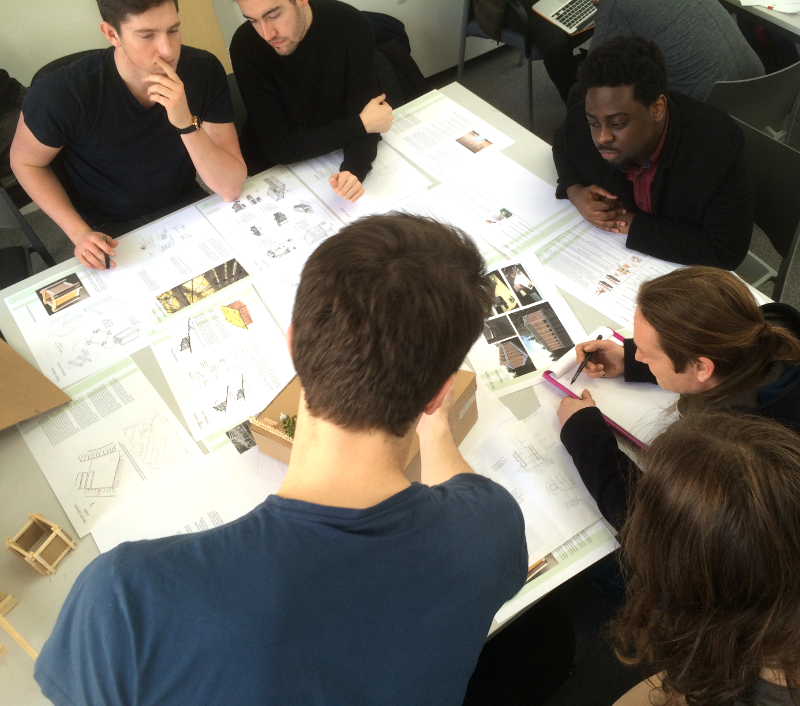 One of the most rewarding parts of the process was the involvement of students from the School of Architecture, Design and the Built Environment at Nottingham Trent University, where I'm a part-time lecturer. Second year architecture students put forward designs for three high-profile sites in Sneinton, the best of which then went forward to an OPUN design review. 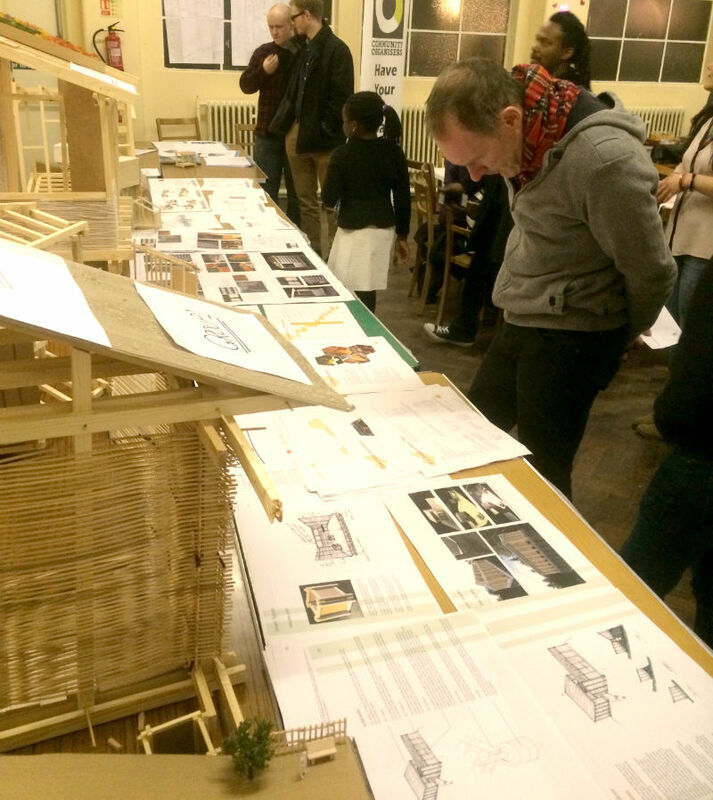 This saw a panel of industry experts reviewing both the student's designs and a draft version of the Sneinton Vision. Developing the Vision has been involved and tough for the local community to support, but the outcome is something we can be proud of. The hope is that this will form the basis of a Neighbourhood Design Plan for Sneinton, which can have real teeth in the planning process. It's nice to get a recommendation and to support local projects! This play centre is in need of extra space for an office and creche, and wants to make use of sunken no-man's land corner of their site. However they have no resources for the project until they get funding, and to get that they have to run the idea past the local planners and other stakeholders. Sometimes in situations like this we can help to break the deadlock by putting a little bit of work in 'up front'. A local contact who we worked with on the Sneinton Trail project put us in touch with the play centre, we went to take a look, and turned out these simple drawings. It's a start. On one level this is just a feel-good thing to do, but it isn't purely altruistic: it means that there might be a real project sometime in the future (one which would improve our community), we build up a huggable reputation, we might get another recommendation out of it, and we can write and illustrate some self promotional material like this. To tell visitors and residents the hidden story of the neighbourhood of Sneinton, a local social enterprise asked us to create a 3D visualisation of the area, where we also live and work. This formed the centrepiece of a printed brochure promoting a tourist trail around Sneinton’s historic attractions. We have had a long term involvement with Sneinton Alchemy, a local social enterprise dedicated to making Sneinton a better place to live and work. The Sneinton Trail was one of their projects, inviting local people and visitors to discover the jewels hidden in the winding streets surrounding George Green’s famous windmill. Teaming up with Nottingham Essence, who gathered information about the local history and took care of laying out the brochure, we set about creating an accessible and engaging “treasure map” for our neighbourhood. We were keen to get across a sense of the landscape and built form, something that is often missing from standard tourist maps. We started by creating a three-dimensional computer model of Sneinton, which served as a basis for the design of the map. Some extra visual survey and on-site sketches brought life and visual clues into the model. The exercise then became a subtle exploration of alternative presentation techniques and colour schemes to strike a balance between, on one hand, keeping the map as simple and readable as possible and, on the other hand, providing enough details for the visitors to easily orient themselves and navigate along the trail. The finished brochure was distributed to all residents of the area, inviting them to go and explore their local heritage. You can also get a free copy of the brochure at many of Nottingham’s tourist attractions, and of course at Green’s Mill! We helped Sneinton Alchemy put together a funding bid for the project by visualising the finished product, explaining the strategy and outlining the community benefits.